We would like to invite you to another season of AmadorArts Murder Mystery Dinners. Back by popular demand, we are offering these special events as an interactive and intimate way for you to engage with the arts! As an Contributing Member of AmadorArts, you will be given priority to get on the guest list. 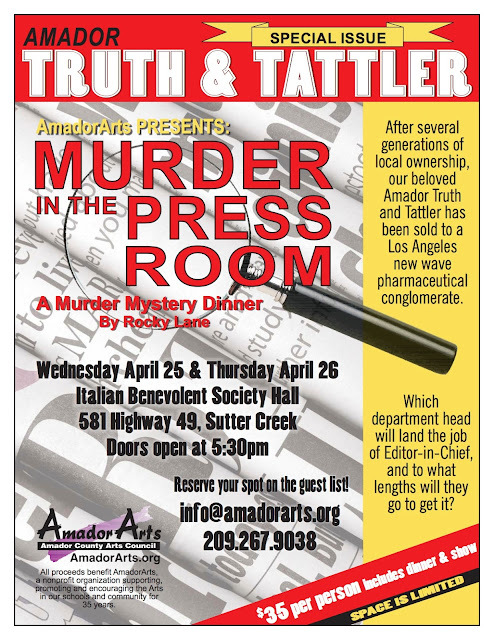 “Murder in Press Room” by Rocky Lane, will be performed Wednesday or Thursday, April 25 or 26, at the Italian Benevolent Society’s party hall at 581 Highway 49 in Sutter Creek . At both, doors open at 5:30 and showtime is 6:00 pm. After several generations of local ownership, our beloved Amador Truth and Tattler has been sold to a Los Angeles new-wave pharmaceutical conglomerate. Which department head will land the job of Editor-in-Chief, and to what lengths will he/she go to get it? Admission is $35 each and includes dinner, dessert and all the fun! For the best detectives in the audiences, prizes will be awarded. Raffle tickets for other mysterious items will be sold, and handy no host bars will be set-up. Gather your friends and reserve your place on the guest list no later than April 18 at amadorarts@gmail.com or phone (209)267-9038. 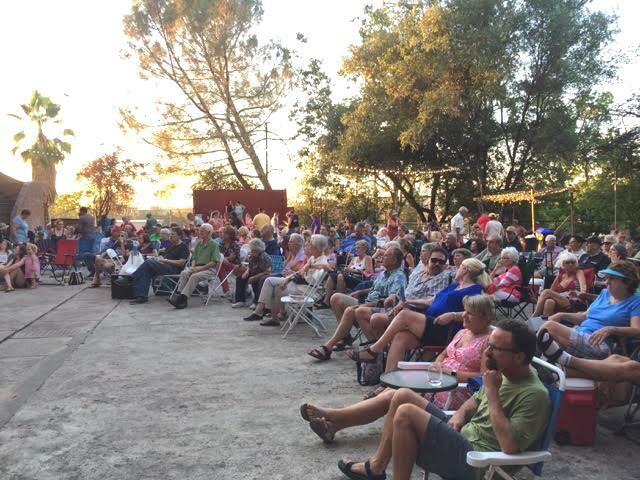 You’re sure to have a rollicking good time while making money for the 36-year-old non-profit AmadorArts, now in the midst of presenting a full range of art classes in local schools and prepping for free TGIF concerts this summer. 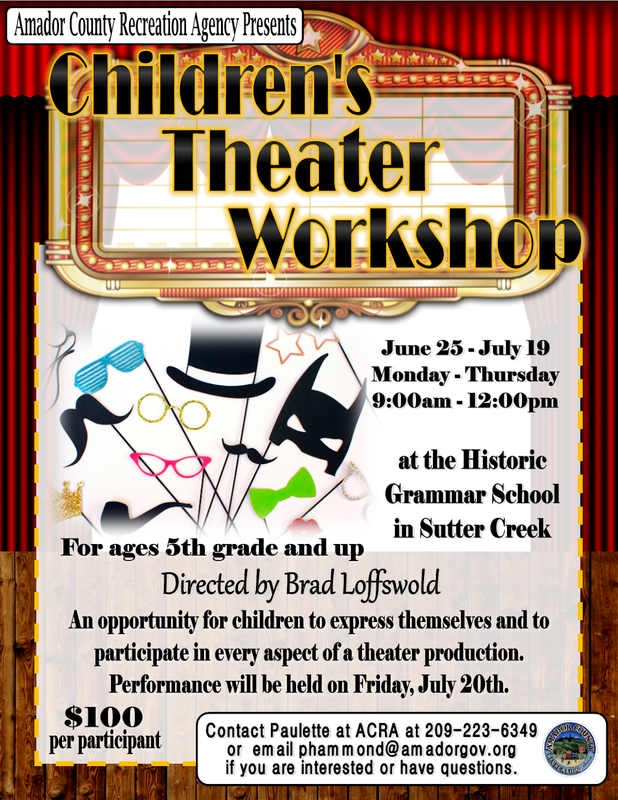 A class for kids 5th grade and up to learn how to express themselves in acting and to participate in every aspect of theater production. This class is instructed by local actor Brad Loffswold. 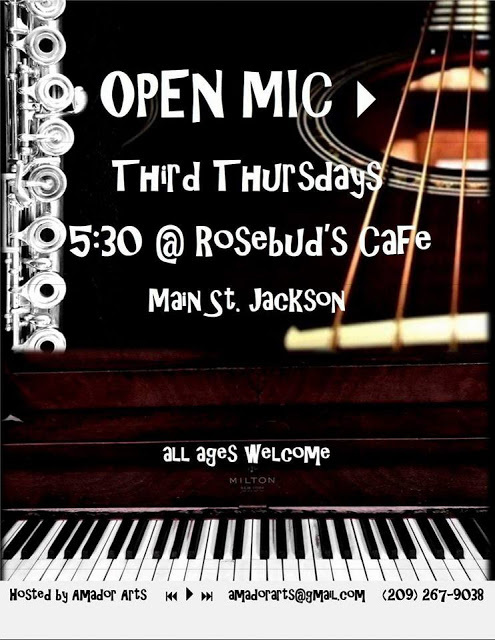 The last time Open Mic Night will be at Rosebud’s Café in Jackson will be March 15. Bid a thankful farewell to the Pulskamp Family for providing this unique venue for the monthly fun event sponsored by AmadorArts. 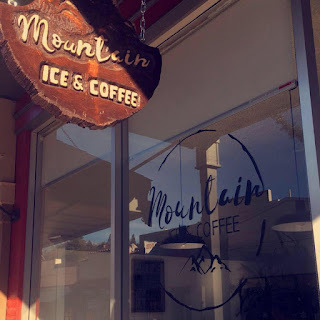 The new home for the Third Thursday event will be at the recently-opened Mountain Ice & Coffee at 42 Main St., Jackson. 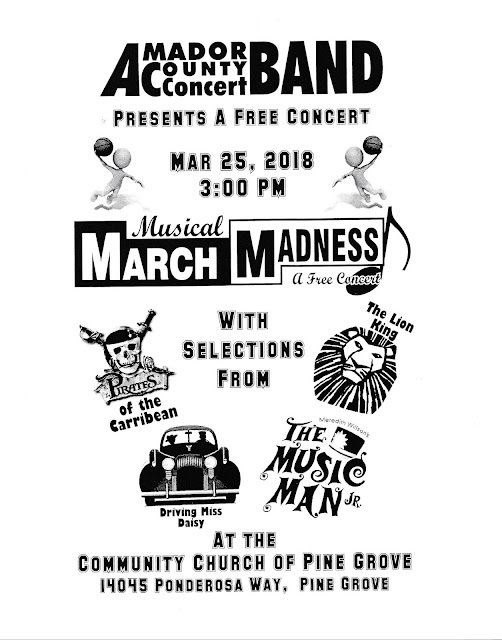 This finale at Rosebud’s will start at 5:30 pm with special guests to celebrate St. Patrick’s Day, so bring your talent and be a part of Amador’s Open Mic history. The April 19th Open Mic, at Jackson's newest, groovy coffee house serving Temple Coffee and Kneading Dough locally baked goods, will provide a fun a relaxing atmosphere with comfy couches for lounging as you enjoy the variety of artists who attend Open Mic. Sign-ups are first-come-first-served, starting at 5:30 pm. One of the newer traditions at Open Mic will continue: Group Art Analysis. AmadorArts launched this unique element in September of last year. Each month the organization invites a local guest visual artist to join us for this experience. The artist brings one of his/hers pieces to Open Mic and an AmadorArts Student Director leads the group in a detailed analysis of the artwork, discussing elements of light, color, line, content, meaning, etc. The artist answers questions, informs on technique and any gallery shows or classes he/she offers. The group element has proven to unite the crowd and make friends out of strangers. 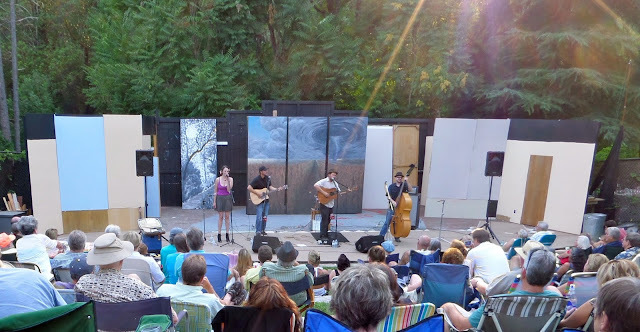 AmadorArts is grateful to Mary Pulskamp and the Rosebud’s Café Family for their generous donation of serving as the venue during the last two years of Open Mic. Mountain Ice & Coffee phone number is 209-256-8005. Regular hours are: Wednesday thru Sunday from 7am to 7pm. AmadorArts is 209-267-9038, email amdorarts@gmail.com. SUTTER CREEK, CA - On Friday, March 30 at 7:30 p.m., two-time Grammy award winner Gill Landry takes the stage at Feist Wines in Sutter Creek. This downtown tasting room hosts award winning musicians in an intimate venue. Landry, is a singer songwriter, multi-instrumentalist, self-styled record producer, storyteller; roadside photographer, dark horse painter, shade tree mechanic, and then some. From hustling the streets of Paris to hitchhiking America on day labor and daydreams, he has slept beneath bridges with his brothers and in the beds of lord’s estates. He began his music career busking on the streets of New Orleans, cutting his teeth through the ranks, interpreting life from the curb up. Releasing his first solo album in 2007 and performing as a member of the band Old Crow Medicine Show, he has opened legitimately and as a stowaway for a number of tours for acts such as Mumford and Sons and Brandi Carlile. Tickets are $18 and are available at feistwines.com or at the tasting room in Sutter Creek. Farm to Fork wood fired pizza and small lot wine are available for purchase. Need to: Relax? Re-Charge? Re-Focus? 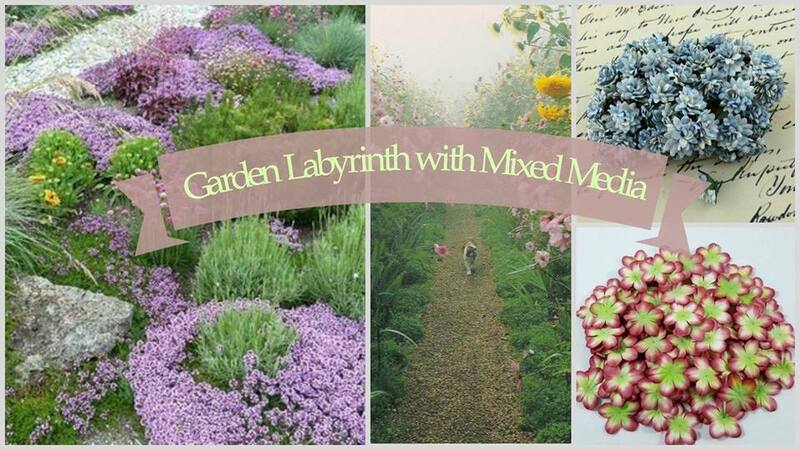 Take a “walk” along the path of your personal garden labyrinth. I’m Deb Wright, a self-taught mixed media artist and your guide as we magically change a blank canvas into a relaxing garden. Join me on April 28, 2018 at the Upcountry Wellness Center and create a lap size garden labyrinth, a beautiful piece of art that can be displayed on a wall or tabletop easel. Using a 12” by 12” artist canvas and mixed media your personal labyrinth will come alive before your eyes! Suitable for all skill levels, although less than 16 years of age requires adult supervision. We will be painting with high pigment paints, which can stain, please wear suitable clothing. All materials to complete your project are included in the cost of class. Workshop registration must be paid in full before April 21, 2018. -----Class may be rescheduled or cancelled if below 6 students. If this happens, I will contact you on April 21st with details. *Additional supplies may be purchased as available.